Insperity® Descriptions Now® is a fast and easy way to define jobs and hire more effectively. Simply choose from the library of thousands of jobs, answer relevant questions about the details of the position, edit, and you’re done. From blank page to final job description, you’re finished in just minutes. Additionally, Descriptions Now transforms job descriptions into job advertisements and generates interview questions so you’re attracting the right people, asking the right questions, and hiring the right candidates. Plus, see the other desktop products including: Performance Now, and Policies Now. The product supports ADA compliance and makes it easy to write ADA-compliant job descriptions. Descriptions Now defines ADA compatible /compliant wording for physical requirements but we do not address disabilities or any definition of that. How many job titles are available in Descriptions Now? Currently there are 3300+ job titles available in Descriptions Now. I want to get a job description but I can't find them? Although Descriptions Now uses a library to build job descriptions we don't provide fully completed descriptions because the application is designed to allow for customization. Can I change the data location for Descriptions Now? Descriptions Now 8 does not allow storage outside of the default location. The default location is typically in a single SQL Server Compact Edition Database File, extension (.sdf). 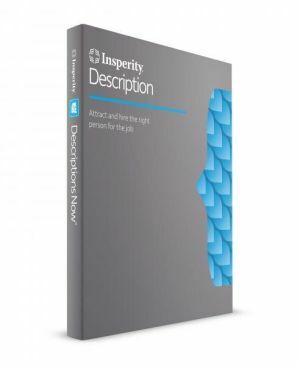 Descriptions Now is a software program that gives you the ability to create a job description at a moment’s notice. It’s very easy to download, and the program is intuitive. If you are accustomed to working with the Microsoft Office suite, you’ll find yourself using the same logic working with this program. The software gives you two options to create your own job descriptions. The first option is using the pre-loaded job descriptions provided with the software. You can look up a job and/or an industry and find literally dozens of options. If you don’t have time to write a job description from scratch, this can be a major convenience. The good news is with both of those examples; you can change the verbiage to match what your organization uses. It’s still a huge convenience but go into the purchase knowing you will probably have to do some editing. The second way you can create job descriptions with this software is by using their format to walk you through the process. Descriptions Now has blank templates that you can use – perfect for unique positions within your organization. Or you can use this option if you want a hiring manager to help with identifying the roles and responsibilities for a job. One of the features I really liked with Descriptions Now was the ability to identify competencies for the position. The competency areas include leadership, interpersonal and self-management. This will be very helpful during the interview process. Speaking of interviews, Descriptions Now offers the ability to use the job description as the starting point for writing employment ads. And they have a partnership with the job board CareerBuilder, so you can post them direct from the program. If you need some help in crafting the ad, not to worry – Descriptions Now has tutorials to assist. One last thing about interviews, Descriptions Now also provides sample interview questions based upon the job description you’ve created. This is awesome – just print off the questions for a hiring manager! And there are tutorials with interview tips and what to do after the interview. Great information to share throughout the organization.